Works are set to start in the area known as tal-Ful in Comino to pave the way as a camping area by summer, the government said. 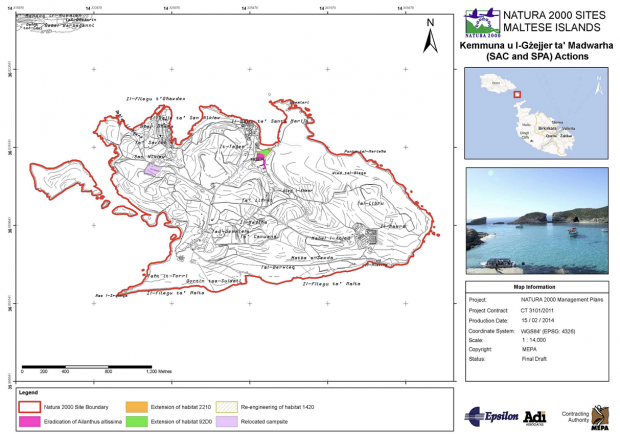 The works, by the Environment Ministry, are being carried out as part of the implementation of the management plan for ‘Comino and the surrounding islands’ prepared by Environment and Resources Authority (ERA). This site will be operated and managed by Ambjent Malta. The area will be cleaned and levelled and containers will be put in place to dispose waste. Indigenous trees will also be planted for the site to accommodate the required functions with the least possible environmental impact. The works are scheduled to be completed by May. Camping in Comino will only be permitted in this area. Regeneration and rehabilitation works will also start in the important ecological area near Santa Maria Bay, previously used for camping. The government said that, for many years, irresponsible actions in this area led to serious environmental damage. These works will be coordinated by Ambjent Malta under the supervision of ERA. Environment Minister Jose Herrera stressed that, as a nation, the Maltese needed to acknowledge the fact that while it was important to enjoy nature through various activities, such activities had to be carried out more responsibly and with the least possible ecological impact.